This antique service station clock has a white face and pale blue frame. 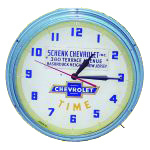 Featured at the center of the clock is a blue Chevrolet logo. “Schenk Chevrolet” is displayed at the top of the clock.